Blue paste brazing flux for stainless steel, nickel, monel, copper alloys, and silver alloys. Active at 1000°F protects up to 1600°F. Performs to AWS A5.31, Type FB3-A, AMS 3410F, Mil-F-4483, and Fed OF499D. Golden viscous aluminum and copper soldering flux active at 350°F to 550°F. Light blue powder flux for sheet and extruded aluminum. Removes oxides at just below the melting point of aluminun. Performs to AWS A5.31, Type FB1-A and AMS 3412D Active from 1050°F to 1250°F. Off-white gel. 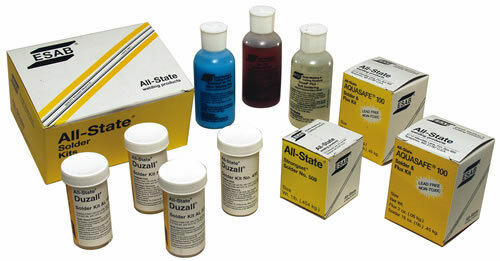 Use in place of Duzall liquid. Non-corrosive residue. Active from 250°F to 520°F. White paste brazing flux for stainless steels, monel, copper alloys, and silver alloys. Active at 1100°F and protects to 1800°F. Performs to AWS A5.31, Type FB3-A, AMS 3410F, Mil-F-4483, and Fed OF499D. Black paste brazing flux for stainless steels, copper alloys, and steels. Performs to AWS A5.31, Type FB3-A, AMS 3410F, Mil-F-4483, and Fed OF499D. Active at 1200°F & protects to 1600°F. Soldering flux used with Aquasafe solder for joining copper and dissimilar metals in drinking water lines. Flux performs to specification Fed O-F-506 Type 1, Form A. The optimum working temperature range is 200-600°F (93-315°C).